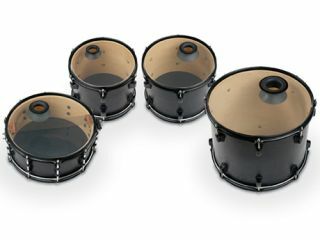 We named the innovative KickPort bass drum sound-enhancer as 'drum accessory of the year' in 2010. And following the CajunPort's debut at NAMM, the company has branched out again, this time with the D-Port snare and tom sound-enhancer. "Based on the same acoustic principles that have made the KickPort one of the world's most popular drum accessories, D-Ports are one, two and three-inch, double-flared extrusions made from a soft, pliable, composite material that enhance the sound of snare drums and tom-toms." "D-Ports are removable and reusable and can be quickly and easily installed in virtually any drum by cutting a small circular vent in the drumhead and mounting the port using a double-sided, adhesive D-Port ring. This procedure, in conjunction with the D-Port's unique design, vents the drums to create a deeper, fatter, more balanced sound with increased clarity and articulation." D-Ports are available in a choice of black and white, individually or in a set of one 1" port, two 2" ports and one 3" port with graduated mounting/reinforcement rings that can also be used as hole-cutting templates. See KickPort International for more.